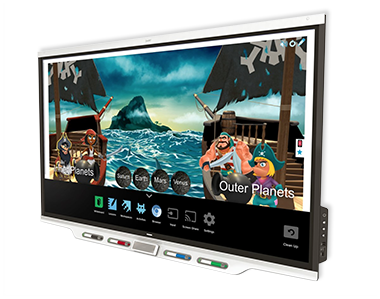 iQ technology is the next generation hub of the classroom technology that comes along with every purchase of LED Flat Panels (For Limted Models Only). 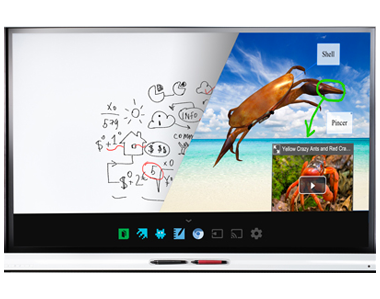 It provides video collaboration for students and teachers, share lesson content on interactive display and the student devices simultaneously. iQ technology also helps create one cohesive experience by allowing users to switch from SMART KAPP to SMART Learning Suite’s interactive lessons, game-based activities, and online co-creation. There’s no need for teachers to load content on the screen. The teachers can create content from home and directly send the content to the Class boards. There is no need of wires and cables and firmware updates. Everything you need is available in one place, and available at the touch of a finger. SMART kapp allows you to save and share notes as they unfold using a regular dry-erase marker. It’s a whiteboard, but everything written on it can be saved in a library in its app. You can also follow along in the app as other people write on the board. SOFTWARE ( 1 YEAR SUBSCRIPTION). The new feature of Super Sort in SMART lab now supports the use of images as sorting items allowing teachers to choose the best suited content for their students. Assigning a time limit to questions is now allow a user to set the number of seconds allowed for each answer. "We have deployed over 800+ SMART Boards since 2014 as part of our M.O.E. Vision for 2020 where Education content and delivery is tuned to address national development. KAYS IT is a committed Education Technology Provider that helped us implement a very complex project which was deployed over 500+ Schools directly under the patronage of Ministry of Education. We are happy to recommend KAYS IT as a Technology Initiator for creating a digital SMART Learning Environments and making a difference for thousands of teachers and Students. We wish them success and will continue to work with them". "We have successfully implemented and created over 60+ Interactive classrooms that enable teachers to bring a shift in the way content is delivered to the children. In today's era, with technologically advanced and sophisticated technology being used in classrooms , we found Kays International as our Technology partner that helped us build a n interactive learning environment and empower our teachers . We are an International School and it is important to build a strong vision and foundation that can help nurture the success of our students and prepare them for the digital era. We are proud to associate ourselves with Kays IT for helping us build our vision into a reality. " " We are an established group of schools in Oman with a drive to create a state of the art school with equipped Technology to help and guide our teachers to improve overall pedagogy. We chose Kays IT as our Education Technology Partner to help us create a value based education for our classrooms. We have deployed over 50+ SMART Boards and trained over 100 teachers to effectively deliver Content to our students. We are very successful in creating a niche by improving overall student performance and also upgrade our teachers skill sets. that help us to qualify and build value in the education system. We are happy to recommend Kays IT as a Technology partner for improving Education ecosystem. We wish them success. "